‘Imperialism abroad — despotism at home’ was once the credo of the Democratic Party, part of its 1900 platform. 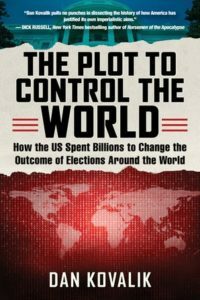 One of the tidbits Dan Kovalik — author of The Plot to Control the World: How the US Spent Billions to Change the Outcome of Elections Around the World (2018) — passed on at his Toronto book launch. Yes, the US is the big interferer in others’ elections, as Kovalik documents. But as counsel of the Union of Steelworkers and lawyer for beleaguered workers in Colombia, Kovalik gave his listeners insight into the little known role the US trade union movement plays — its betrayal of trade unionists abroad. Dozens of Colombia worker-heroes owe their lives to his lawyer smarts and dedication to the working class. As an American, he takes the evil of imperialism seriously and risks his own life to fight it. A real ‘working class hero’. Kovalik doesn’t pretend to document all the US crimes (read William Blum for that). Rather, in The Plot he takes you on a world tour to Eurasia, Africa and the Americas for key election rigging moments, moments that he connects with viscerally, and brings to life. He doesn’t get to Venezuela, but it’s really not necessary. Same old, same old. There is a clear template that has been honed over the decades, and that makes the Maduros and Talibans around the world justifiably cynical about US ‘democracy promotion’.